4 Label Sizes 4 to 14 Sauare Inches! Just dare them to say they can't see the picks this year! What's going on at Bruno's? 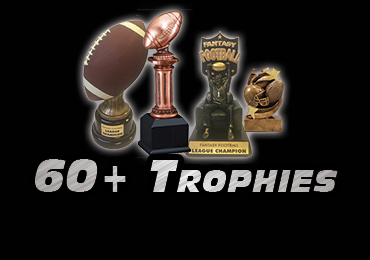 We have a ton of trophies still available. Don't wait till your favorite is gone. We launched the new site for football season. 2019 is the first year that the new site will be active. Pardon our dust. You'll see several new fantasy baseball trophies available in the store. will be back for 2019 as we got a new piece of machinery that allows us to laminate more efficiently. 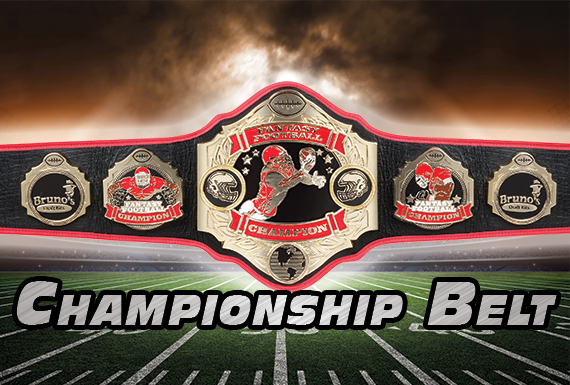 Check out our latest football product, the Championship Belt. Hulk Hogan would be proud! Free shipping entire order when you get one. This new size is for football. Baseball would just be too big, although we may change our minds if there is demand. Since 2010, we've offered Medium and Jumbo custom team labels. As of 2018 football, you'll see a new size, the 2X Jumbo....so you can more clearly see the teams from a distance. ALSO, no more getting mad when we have you RE-enter them each year. Now this process is automated BEFORE checkout. We've already enhanced the performance, and we're hoping to add some new features this summer. Until you see the option available for the 2X Jumbo Team labels within the draft board design, make sure to add an extra round to your draft board to account for it if you plan to get it. If you reside outside the US, There is a SUBSTANTIALLY more affordable shipping option available to you as long as your draft is not less than 3 weeks away. New Economy Shipping Option just for you. Wish we could offer it coast to coast, but it is only available to ND, SD, NE, MN, IA, WI, IL, MI. Look for it at checkout. As always, The Bigger, The Better! 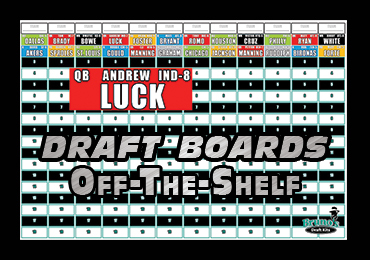 Design your own customized draft board in seconds with our app. •Just reorder labels each year. 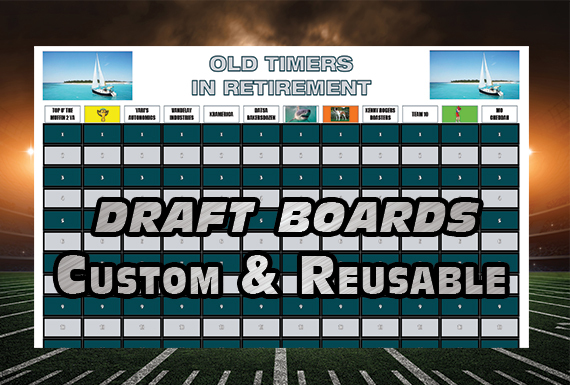 You already have a custom draft board. •Made from heavy-duty polypropylene banner. Not paper. •Lamination enhances look and allows for removal of labels. •Tallest label out there. 14 Square inches...Wow! •Numerous sizes. 12-16 Teams x 18-29 Rounds. •Up to 12 Teams. Up to 36 Rounds. 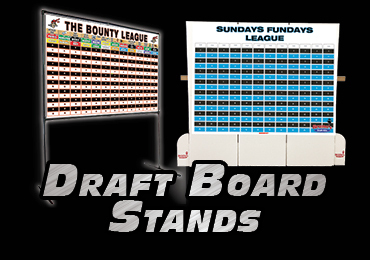 Bruno's provides premium fantasy draft boards for baseball and football. The finer details allow for an organized and well-run draft party. More visible, high-contrast labels make your draft easier on the eyes in a darker room, and a custom draft board in your favorite color scheme adds that finishing touch. Your group won't be disappointed. Bruno's, the draft board of choice for the experienced Commish.